During the first few decades of the 20th century all of Aravalis and the Vindhyas were thickly forested and were teeming with wildlife, including tigers. By the end of 1960s, as a result of sustained logging, prime forests were left in only a few isolated patches. Since, till the late 1950s, Ranthambhore and Kela Devi were the private hunting grounds of the royalty of Jaipur and Karauli, respectively, they got a level of protection that the other forests of this belt did not. Due to this protection tigers survived in forests around Ranthambhore and Kela Devi, till the launch of the Project Tiger. In 1973, when the when the Project Tiger was launched, Ranthambhore was one of the original 9 reserves to be taken under the Project. By then tigers were on the brink of extinction in and around Ranthambhore. Mr. Fateh Singh Rathore, who was in-charge of Ranthambore when the Project Tiger was launched, is on record stating that, "three years elapsed since the launch of the project, when the first tiger was sighted in Ranthambore". At that time there were 16 villages inside the sanctuary (what is now the national park) but between 1976 and 1979, 12 of these villages were shifted outside the sanctuary. In 1980, in order to give greater protection to the forests, an area of 282.03 sq. k.m. 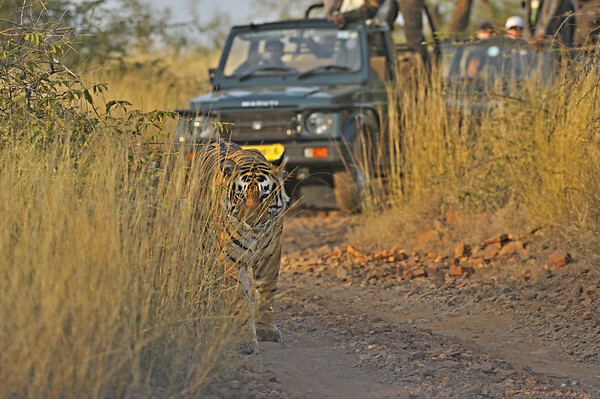 of the inner part of Sawai Madhopur sanctuary was declared as National Park. Since then the state Government stopped collection of any forest produce from sanctuary and National Parks. In the year 1983, 647 square k.m. of forests lying to the North of the National park were declared as the Kela Devi Sanctuary and included in the Tiger Project. Similarly, in 1984, 130 square k.m. of forests lying to the South of the Ranthambore national park were declared as Sawai Mansingh Sanctuary and included in Ranthambhore Tiger Project. In the 1970s, tiger sightings were few and far in between. It was almost impossible to estimate the number of tigers that were there in the Project tiger reserve. By the middle of 1980s, after more than a decade of protection, Ranthambhore's shy, elusive and nocturnal tigers, gradually changed their behavior and became more and more diurnal and visible. By the end of 1980s, Ranthambore had become probably the best place to see wild tigers in the world. The beginning of 1990s was a bad time for reserve's tigers. 1990 and 1991 saw a dramatic decrease in the number of tiger sightings in the national park, compared to a few years ago but there was nothing to indicate that this had taken place due to poaching. To quote from the State empowered committee of Rajasthan - "In 1992 a poacher was caught in Ranthambhore and it was realized, in subsequent census, that the population of tigers had fallen by half." Since then policing inside and outside the tiger reserve was intensified but it took almost a decade for the tiger population to rise to figure of over 40. In 2003 and 2004, disaster struck Ranthambhore's tigers once again. A census conducted by a high powered committee showed that there were only 26 tigers in Ranthambhore tiger reserve and all of them were with in the Ranthambhore national park. The other areas of the reserve were totally devoid of tigers. To quote from the report of the Tiger task force, set up by the Prime Minister of India - "in Ranthambhore, which is now known to have lost a large number of its tigers......the threat of poaching remains...". In 2005, the Rajasthan and the Indian government set up high powered committees to look into the state of Ranthambhore and to suggest measures to improve the situation. This put the spotlight back on Ranthambore and the tiger crisis in India and since then the forest and the police department intensified the protection around the the tiger reserve. Since then there have been no reports of poaching from around Ranthambore and a large number of tiger cubs were born between the summer of 2005 and the summer of 2006. Ranthambhore is a dry-deciduous forest, which means that there is little undergrowth and most of the trees shed their leave in the dry season. Out of all the tiger reserves in India, Ranthambhore gets the least amount of rainfall and as a result there are very few patches with tall grasses. Besides, this Project Tiger reserve has an excellent network of forest tracks (that are motorable in the dry season). Another sign that is worth looking out for are pugmarks of tigers. Tigers leave behind footprints or pugmarks when they walk on soft soil. In the dry and soft soil of Ranthambore these are relatively easier to find. A good tracker can roughly estimate how long ago these tracks were made. If the tracks appear to be recent or "fresh" the it is definitely worth while to follow them till where you can. Pugmarks are definitely the most important signs that show the presence of one or more tiger. So when you go your tiger safari, look out for pugmarks and keep your ears open for alarm calls. This would tremendously improve your chances of finding tigers. However, you must always keep in mind that finding tigers in the wild is still a matter of chance and that there are no guarantees of finding one.